You may think you’ve been there and done that, but in our opinion the Côte d’Azur can be a place of inexhaustible pleasures. As far as we’re concerned, its appeal endures, because when you do it the right way it’s a place that makes you feel good. Is there a lovelier stretch of coast in Europe than the Riviera? 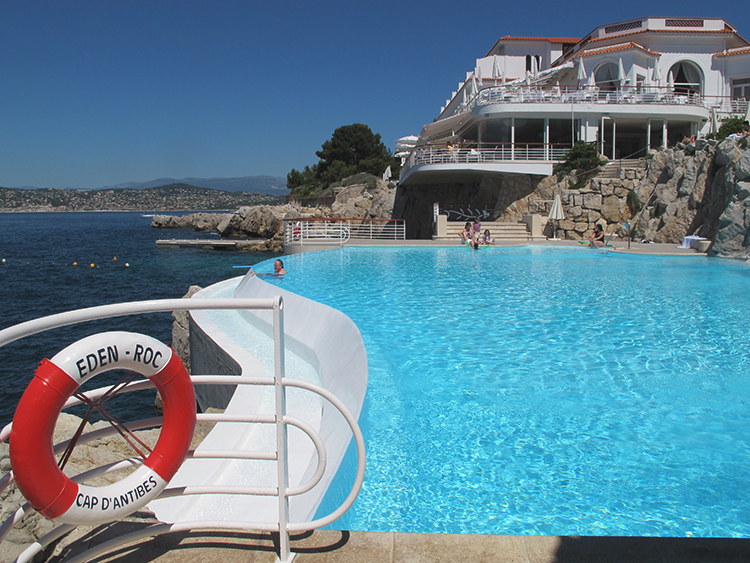 Of course, this is subjective… but the Côte d’Azur is certainly one of the loveliest. People love to knock it, and we can understand why. They talk of the crowds (well, not if you choose your retreat carefully). They say the sea can be polluted (not early in the season before the heaving boat traffic arrives). Sure, the bad and beautiful and the very wealthy have been coming here for well over a century, but that doesn’t mean it’s tired or aged or plain worn out. The Riviera is not just physically beautiful, it is well endowed with first-rate hotels (although only two make it onto our absolute shortlist, with a third contender). It’s also wonderfully convenient, at least for Londoners and those in the southeast. If you’re coming from the UK, it’s a flight of just 90 minutes. And unlike so many places, Nice is a pleasure to fly into. Its airport is streamlined, modern and efficient, set right by the Mediterranean and girded with palms. And there are always taxis and trolleys available (remember to have a €1 coin for the latter). Assuming you’re staying on either of the capes that flank the most desirable stretch of this coast, it shouldn’t be more than a half-hour drive to your destination. But be warned: if you choose to come in high summer (which we wouldn’t) the roads can be clogged to madness. But if you can lose the traffic, the Grande and Moyenne Corniches, which run east from Nice, are stunning routes to motor along (think of Grace Kelly and Cary Grant in To Catch a Thief), with panoramic views and lots of agreeable places to stop off. Avoid the Basse Corniche, which can be extraordinarily busy. Otherwise, the autoroute is fast but it certainly ain’t pretty. There are so many things that make the Riviera alluring. First there’s the coast itself (bien sûr! ), the hilly landscape inland among the Alpes-Maritimes and Massif de l’Estérel, and the balmy climate. Then take the romantic and extraordinary gardens: the exotic Garden of Èze, the Ephrussi Gardens at Saint-Jean-Cap-Ferrat, and the garden of the Renoir Museum at Cagnes-sur-Mer, to name but three. There are also the exuberant fruit, vegetable and flower markets and, of course, the art. In Nice alone, there’s the Musée Matisse (the artist arrived here in 1914, and spent much of the rest of his life in the area), the Musée Marc Chagall, the Musée d’Art Moderne et d’Art Contemporain (MAMAC) and the Musée des Beaux-Arts. Further afield there’s the Musée National Fernand Léger in Biot, the Musée Picasso in Antibes and the Musée Renoir in Cagnes-sur-Mer, which we mentioned above. And that’s before we venture inland. Avoid the humid and crowded conditions of high summer, when the schools are on holiday and European employees take their annual vacation. Of course, that is also the best time to see and be seen, but unless you are lucky enough to be on board a decent-sized yacht, which is by far the best way of doing the French Riviera, we don’t think it’s worth the sacrifice. Whatever the time of year, the extraordinary light and colours are sublime. The glittering blue of the sea (it’s not called the Côte d’Azur for nothing), the black-green of the massif, the shimmering offshore Iles de Lérins, the ochre and terracotta of the buildings, the abundant verdure are the reason so many artists were drawn to the area. The clarity of light after a mistral is unforgettable. In terms of geography, the Côte d’Azur runs from just west of Cannes – La Napoule probably marks the boundary – to Menton, a little east of Monte Carlo. It’s important to note that it does not embrace Saint-Tropez. This may be one of the most famous resorts in the South of France, but it isn’t technically on the Riviera, even if many people think it is. In fact it’s in an area known more prosaically, at least for administrative purposes, as the Western Côte. As far as we’re concerned, the main focus of interest on the Côte d’Azur is around the two capes – Cap d’Antibes and Cap-Ferrat – which constitute some of the most expensive real estate in the world. They also have the two best hotels, each occupying prime ocean-facing locations. The former is midway between Cannes and Nice, and is the site of the area’s most famous hotel, the legendary Hôtel du Cap-Eden-Roc, which epitomises the F. Scott Fitzgerald ethos of the area – the faintly decadent wealthy at play. It’s also where the biggest names stay for the Cannes International Film Festival. Midway between Nice and Monte Carlo, Cap-Ferrat, by contrast, is more secluded, residential and discreet, with a less glitzy profile than Cap d’Antibes. 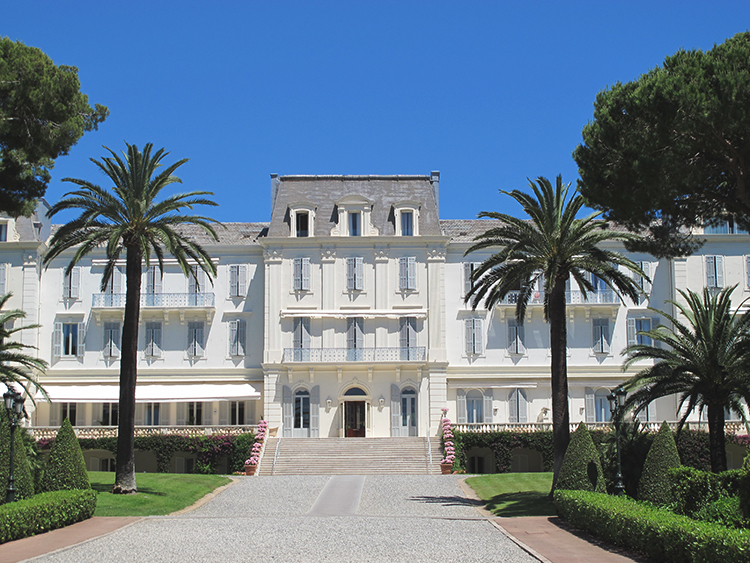 Its forested peninsula is dotted with elegant villas, with the Grand-Hôtel du Cap-Ferrat (now a Four Seasons property) at the tip. Even at the height of the season you could be ensconced here and feel you’d left the world behind (but, importantly, not its comforts). Between the capes (though closer to Ferrat), stands Nice, the capital of the Côte d’Azur: an all-year-round, living, breathing city (the fifth biggest in France) with an intriguing life of its own. It isn’t somewhere we’d recommend for a vacation, though, or for a true luxury hotel experience. Cannes, where the Riviera turned from a retreat for winter warmth to a prestige summer destination (once Coco Chanel had created the fashion for sunbathing in the thirties) has lost most of its cachet. So much so that the Rough Guide calls it a ‘grotesquely over hyped urban blight on this once exquisite coast’. This is largely a result of its preoccupation with trade fairs and conferences: the Cannes Film Festival may retain a certain allure, but it is only one of many media markets – for the advertising, television, music and other less creative industries – that take place here all year round. A little way east of Cannes, you’ll come to Juan-les-Pins, an overcrowded, overdeveloped poor relation of exclusive Cap d’Antibes, and of the relatively unchanged ancient walled town of Antibes with which it fuses. That said, parts of Juan still have a period charm, capturing a little of the 1930s glamour that made this coast what it is. And if this is what you are seeking you might enjoy the ocean-front Hôtel Belles Rives where F. Scott Fitzgerald lived in 1926. The style is authentic art deco and the beach perfect, with its water sports jetty. The cuisine is actually better than at its more soigné and much higher-priced neighbour, Hôtel du Cap-Eden-Roc, a little further south on the cape which juts out into the ocean beyond Antibes-Juan-les-Pins. Of course you may decide to venture into a hilly hinterland. If you do, there are some truly charming villages – not least Saint-Paul-de-Vence, with an artistic heritage even tourism could not extinguish. At the other end of the scale, Monte Carlo continues to attract – how can we phrase this politely? – well, those with far more money than taste, and Formula One drivers seeking a tax haven. Oh, and Italian weekenders who drive up in their amazing sports cars. And yachters of the most ostentatious kind… For yacht spotting, there is nowhere like it. In some ways, however, Monte Carlo encapsulates what is special about the whole area. After all, this is a place where the policemen still wear white gloves. And what could be smarter, more extravagantly impractical, or more redolent of the luxuries, appearances and standards of a bygone age, than that? 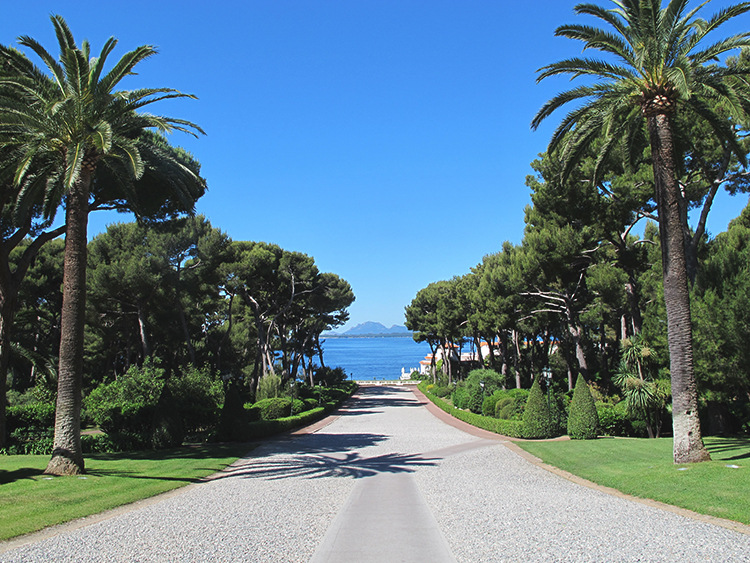 The two best hotels, Hôtel du Cap-Eden-Roc and Grand-Hôtel du Cap-Ferrat, occupy the two finest Riviera locations. Cap Estel and La Réserve de Beaulieu vie for position of the potential third in line, the former for the size of some of their top suites and the isolated ocean-front location; the latter for excellent service and old-fashioned Riviera boutique hotel style. La Réserve does, however, need to reinvent itself if it is to continue competing with the top grandes-dames; and Cap Estel needs to improve management and service. Overlooking the picture-postcard harbour of Saint-Jean-Cap-Ferrat, La Voile d’Or, also a former favourite, no longer makes it onto our shortlist. It has hardly changed in the 30 years we have known it and, to meet Nota Bene criteria, is now in need of investment. Yet could there be a lovelier location east of Nice? For those a little more budget conscious it is still worthy of consideration. In summary, the finest hotels on the Côte d’Azur are the ‘palaces’, which occupy the two most exclusive ocean-facing locations on the capes either side of Nice. And for the time being, nothing else comes close. Much is made of French cuisine, which over the past 10 years has, in our opinion, gone down in quality and up in price. For those who want to visit the Côte d’Azur and enjoy different dining experiences, our advice is to take heed and choose very carefully. There are far too many restaurants resting on their laurels, living on their reputations, and simply no longer up to the mark. 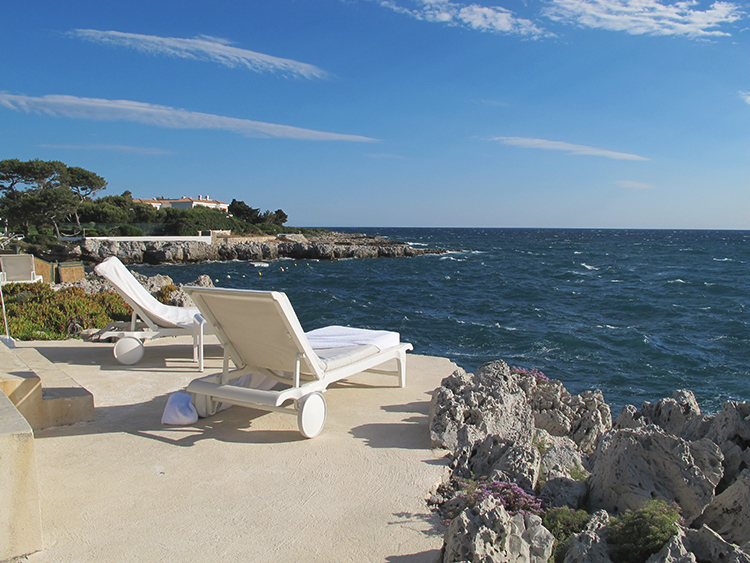 In the area of Cap d’Antibes there is very little we really love – we certainly don’t rate the restaurant at Hôtel du Cap-Eden-Roc (even though we love the setting). And Bacon, heavily recommended by hotel concierges, we find both over-priced and overrated. Also over-priced, but still not to be missed if you want the best bouillabaisse on the coast, is Tetou, an institution among restaurants. We prefer to venture that little bit further and go to Nice for one of our absolute favourites, La Petite Maison. Or drive up to Saint-Paul-de-Vence to La Colombe d’Or, more for the ambience when sitting outside on that magical terrace, for the history of the place, and for the fact that you can eat quite simply, than for extraordinary food. On the other side of the coast, east of Nice, there are several favourite ‘toes-in-the-sand’ affairs to choose from. Paloma Plage at Saint-Jean-Cap-Ferrat, for example, is the only proper beach on the peninsula. Its restaurant, which is open for lunch and dinner, is delightful at night when sitting at a table at the edge of the sea, the inky black water and lights of the coastline of Èze in front of you. Romantic and charming, it’s a great choice for a grilled daurade (sea bream) and a bottle of local wine. One place that is not on everyone’s radar is La Pinède at Cap d’Ail. Close to Cap Estel and Monaco (it is the last town on the Riviera before you get to Monaco), La Pinède is more of a trattoria, overlooking the sea, where the emphasis is on fresh fish and seafood in a secluded setting with a laid-back atmosphere and charming staff. By contrast, also for fish, La Mère Germaine at Villefranche-sur-Mer, opposite the western side of Cap Ferrat, is the perfect harbourside spot for both lunch and dinner. 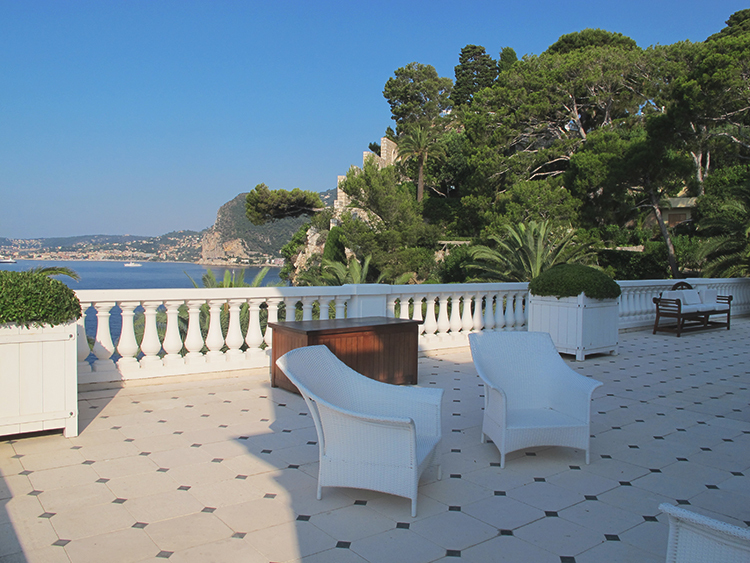 For those who like fine dining, Le Cap at Grand-Hôtel du Cap-Ferrat is excellent. The chef, Didier Aniès, will always prepare in advance to his guests’ specific requirements. It’s expensive but worth it for the quality. It’s also somewhere to dress up for. If you want to go into Monte Carlo (on balance, we wouldn’t any longer) we recommend dining at one of the venues in the Metropole hotel: Yoshi, for exquisite cuisine in Joël Robuchon’s first Japanese restaurant. Otherwise, for a really good quality hotel grill try Le Grill at Hôtel de Paris – always frequented by a top-notch clientele. For a fun evening out, go to La Trattoria in the Monte-Carlo Sporting Club and reserve a table afterwards at Jimmy’z. There is also Sass Café, a small local nightspot, which can get quite wild. It’s nothing great in the culinary stakes, but promises a highly animated evening.